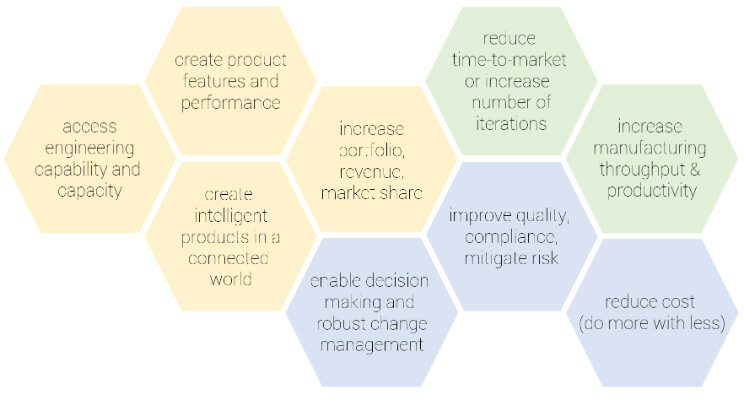 Manufacturing organisations strive to create MORE innovative products and increase their portfolio, combined with FASTER time-to-market and increased productivity supported by BETTER decision making, quality and cost control. Pressured by both consumer preference for more segmented vehicles and the need to reduce costs for competitive and regulatory reasons, OEMs are adding to the number of models they offer and at the same time reducing the number of vehicle architectures on which they are built, drastically improving product commonality. Aiming at flexible product platforms might result in increased complexity and costs somewhat, but the additional expense is outweighed by savings from the sharing of common components between cars and platforms, and increased volume. The adoption of these next-generation common platforms will also lead to a consolidation of suppliers that will result in a smaller number of large, global players. The cost of electronics and software content in autos was less than 20% of the total cost a decade ago; today it is as much as 35%. Electronics systems continue to contribute more than 90% of innovations and new features. All major OEMs are targeting traditional product areas such as quality and safety; infotainment provides a way for OEMs and suppliers to differentiate their products. Telematics features, including semiautonomous driving aids such as automatic parallel parking and lane-keeping assistance as well as sensor-based reporting on car maintenance and usage, also present the chance to forge a closer relationship with customers and increase margins. OEMs and dealers can offer more convenient proactive service, alerting a car owner to upcoming maintenance or repairs. In addition, telematics features afford opportunities for tie-ins with insurers, such as offering discounts for customers who drive safely. Given the increase in electronic content, OEMs need to collaborate with suppliers and experts outside the traditional auto industry. Accomplishing this will require changes in the way OEMs function. For example, they may need to use venture funds to nurture and support companies that can innovate technologically, and provide access for more non-traditional suppliers, including hardware and software companies. One promising and efficient path includes to move toward more standardised interfaces, systems, and modules for telematics and infotainment. OEMs are likely to prioritise engineering projects to focus on those that offer the best value and differentiation and to address new safety and environmental regulations in the most cost-effective way. This includes working closely with suppliers to determine whether the OEM or the vendor, or a combination of the two, is best equipped to develop the technology and innovative solutions needed to meet the regulations. Moreover, OEMs must improve their skills in gathering and analysing consumer data to serve their customers better and improve brand loyalty. The move to modular platforms will require OEMs to work closely with suppliers to realise the cost savings and manufacturing improvements that they hope to gain by increasing scale. Key suppliers look to partner with innovative non-traditional automotive electronics and infotainment suppliers to utilise their speed-to-market and (sometimes) higher scale. Dramatically increasing demand for ESO skills and capacity in Connectivity and IVI-related engineering services as especially driven by customers’ “always on” attitude. Highest share of outsourced work in Europe (circa 30%) in E/E, also incl. connectivity/In-Vehicle-Infotainment, in China around power train/powertrain electrification (circa 25%). Intelligent product also regroup considerations about smart factories and connected enterprises. The increasing importance of infotainment and telematics systems is disruptive for OEMs and traditional suppliers, putting a premium on innovation and changing the ways that industry players design and develop new products and services. Software breakthroughs are becoming as critical as hardware innovation, and competition is increasingly coming from non-traditional players. Ever more vital software content has also accelerated the pace of change in products and features. Whereas the timeframe for new vehicle launches is typically three to four years, the cycle for new software iterations, often driven by interactivity with mobile devices, is measured in months. OEMs and suppliers will need to conduct supply chain capability and risk assessments to identify and address weak links. Trade-offs will be required for investment in capacity, automation, and utilisation to ensure readiness and to maintain flexibility. Now is the time to assess and make improvements to operating models, to minimise supply chain complexity, and to augment tools and systems for improved visibility. In the commercial aerospace sector, given the high backlog in the industry it is expected that production levels will continue to rise, as they have been doing since 2008 and surpass the record level of 1,352 in 2014 over the next 20 years. The entire supply chain is also under pressure to step up the production rate in order to keep up with the high demand for aircraft. The Internet of Things (IoT) has the potential to fundamentally shift the way we interact with our surroundings. The ability to monitor and manage objects in the physical world electronically makes it possible to bring data-driven decision making to new realms of human activity – to optimise the performance of systems and processes, save time for people and businesses, and improve quality of life. From monitoring machines on the factory floor to tracking the progress of ships at sea, sensors can help companies get far more out of their physical assets – improving the performance of machines, extending their lives, and learning how they could be redesigned to do even more. Most IoT data are not used currently. For example, only 1% of data from an oil rig with 30,000 sensors is examined. The data that are used today are mostly for anomaly detection and control, not optimisation and prediction, which provide the greatest value. 41% manufacturing executives relied on data and analytics when making their last big decision. Powertrain and powertrain electrification as driven by CO2 emissions regulations in Europe and China. Increasing demand in powertrain-related engineering services, both conventional and (some) hybrid, with higher share of alternative propulsions and fuels (CNG, xEV) also opportunities for related engineering services and component business (CNG tanks, battery packs, etc.). Weight reduction technologies as driven in the same context, especially on the European market. Weight reduction technologies will be applied as additional measurement to meet the CO2 emissions regulation target, but with focus on larger/premium vehicles (lightweight design for volume models). Regulatory pressures to reduce overall fleet emissions are steadily adding to automakers’ costs. For example, US CAFE standards that will go into effect in 2016 are projected to add as much as $1,000 to the production cost of a vehicle, according to the National Automobile Dealers Association. Only a minority of auto buyers are willing to pay for more environmentally friendly choices such as electric vehicles, so the cost pressure falls largely on OEMs. One way to meet the tighter standards, which mandate that manufacturers’ fleets average 34.1 miles per gallon, is to reduce weight by substituting lighter materials – most dramatically evidenced by Ford’s decision to replace a substantial amount of steel with aluminium in the 2015 version of its F-150 pickup truck. This adds some $500 per truck in raw materials costs, more than the $395 MSRP increase Ford has announced for the new base model, according to a number of websites that cover Ford news. Regarding reduction of fleet average CO2 emissions, diesel efficiency improvement is a key lever to reach the target from the CO2 emission regulations in 2020/2021. It is likely that diesel engines will decrease its market share, but remain the dominant powertrain in upper vehicle segments. The expense of mandated safety equipment is also difficult for OEMs to pass along. For example, the US Department of Transportation’s requirement that all new vehicles have a backup camera increases vehicle costs by as much as $200, at least some of which OEMs will have to cover themselves. The global defence industry in 2015 and beyond will be challenged in two major ways: how to grow profitably in a declining market and what actions are necessary to cut costs to maintain acceptable financial performance. Successful defence companies have already been anticipating defence budget cuts and have been reducing staff, cutting overhead costs, and getting lean. They are accelerating the substitution of process automation over more expensive labour, resulting in higher operating earnings per employee. Digital product development and computer aided design have been a game changer by creating significant efficiencies in the product development process. Lean manufacturing and six sigma initiatives have significantly cut waste and inefficiency in the production process. European A&D companies have the challenge to gain efficiencies in the cost and asset base as they continue to deliver below average operating performance in comparison with their US peers. The above are only examples extracted from published studies as per the list of references below; they illustrates that most business objectives will aim at addressing a combination of various business benefits to address or respond to these KBFs and their time-cost-quality implications. Roland Berger (2014) Engineering Services Market Study. This post was originally published on LinkedIn on 28 March 2017.